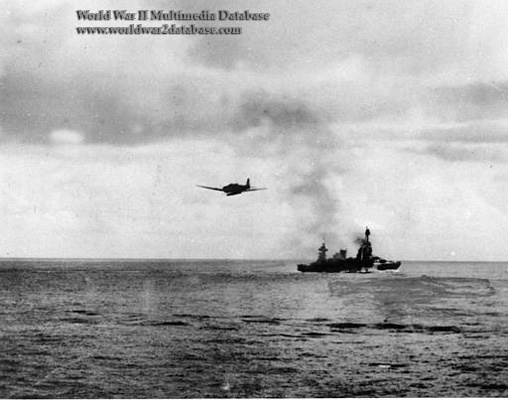 Battle of Santa Cruz, October 26, 1942. Nakajima B5N2 Type 97 Carrier Attack Bomber (Allied code name "Kate") carrying Type 91 17.7 inch (45 centimeter) torpedo heads for USS Hornet (CV-8). USS Northampton (CA-26) is behind the Kate. That morning USS Enterprise (CV-6) planes bombed carrier Zuiho. Planes from Hornet severely damaged carrier Shokaku, and cruiser Chikuma. Two other cruisers were aleo attacked by Hornet aircraft. Meanwhile, Hornet, herself, was fighting off a coordinated dive bombing and torpedo plane attack which left her so severely damaged that she had to be abandoned. Survivors were soon picked up by destroyers. Northampton tried several times to tow the stricken carrier to safety. The abandoned Hornet, ablaze from stem 'to stern, refused to accept her intended fate from friends. She still floated after receiving nine torpedoes and more than 400 rounds of 5-inch shellflre from destroyers USS Anderson (DD-411) and USS Mustin (DD-413). After attempting to tow her as well, Japanese destroyers also tried to sink her by firing four 24-inch torpedoes at her blazing hull. At 0135 Hours, October 27, 1942, she finally sank off the Santa Cruz Islands. Her name was struck from the Navy List January 13, 1943.